The sun was still below the horizon at 8:30 this morning. I love it when the sun shines on the bottom of the clouds from over the horizon. You can also see that we got our first dusting of snow today and it continued to fall for most of the day. I did manage to get in one last ride yesterday afternoon but wasn't out too long as the bike was feeling a bit "squirrelly" due to little patches of ice on the road. We have a lot of households in Fairbanks who haul their own water. I.e. they have a 300 gallon tank in the back of their pickup and buy water in town and haul it to their house where they empty it into a water tank. If they are sloppy, water overflows into the truck bed and on every uphill section, water dribbles out onto the road which promptly freezes into a patch or a strip of ice. So on any uphill section, you need to examine the road for these patches of ice. I think that it's about 1¢ per gallon if you haul it yourself and about 6¢ per gallon delivered. 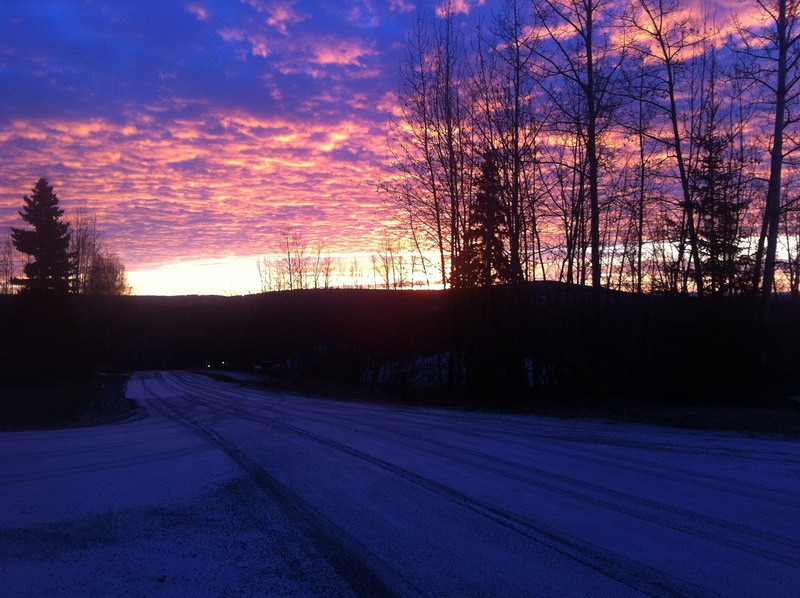 By evening, most of the snow was gone but the forecast is for continued light snow for the rest of the week. I guess riding season is really over. 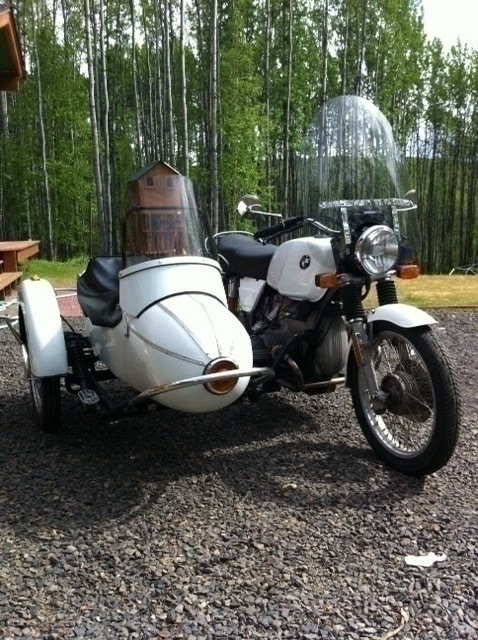 Some have been asking about a sidecar. The owner of the nice Cozy sidecar currently attached to his R100/7 agreed to sell me just the sidecar. He also has a subframe he purchased from Dauntless Motors/DMC still wrapped in the original shipping material. Jay from DMC, confirmed that there is very little difference between the /7 and my RT and the subframe should fit just fine. Since I didn't really want to learn how to drive a sidecar rig in the middle of winter, we agreed that I could pick it up closer to Spring. I ended up riding 9,470 miles this riding season and averaged 40.0 mpg. The mileage isn't too bad but not great either. It has been steadily dropping since about the middle of July which suggests carb work. Another local Airhead member volunteered to go through the carbs with me as I have never taken apart a constant velocity (CV) carburator such as the Bings. The maintenance list for the bike isn't too long this Winter. No long motorcycle trips are planned for next summer. Brrrr snow. At least it waited until October and picking up the sidecar closer to spring gives you something to look forward too besides more light and warmer temps. A lot of people are waiting for the snow as the transition times seem to be bad. Too cold for summer activities and no snow for the winter ones. The days are getting shorter down here too. It feels like it's dark at 5:00 p.m. Oh well 2 and a half months and the days will start getting longer again. It will be riding time before we know it (I keep telling myself). Riding is at least 6 months away but I have a winter trip to look forward to and plan for. so sorry about next year being a non-touring year . . .
Love that first picture. I went out yesterday on my bike at 34F and I thought that was cold. I admire your fortitude, living where you do. wow. $0.01 per gallon huh? I think we pay $0.01 per 1000 gallons here for city water. Even at that price, it is a bargain compared to a well these days. I think they are running about $45/ft. 200 foot will buys quite a few tanks of water. Cool news on the sidecar!! I'm with Dom. I wouldn't have the patience. But it does sound like you have some good work ahead of you dueling the winter. Meaning, no long motorcycle trips planned.